Home » Environmental Chemistry » Green Chemistry on your Smart Phone! The focus of the above paper is mostly on “Green Solvents”, which the authors developed based on the ACS GCI Pharmaceutical Roundtable Solvent Selection Guide. It is freely available for iPhone, iPod touch and iPad. 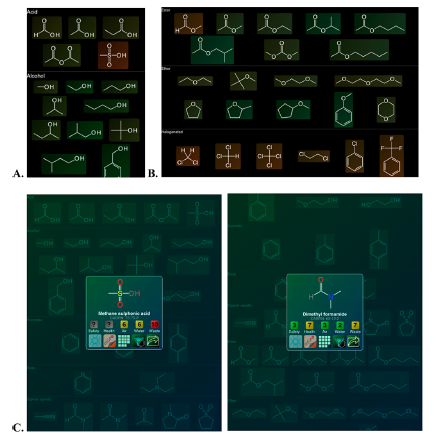 (I personally use the Android platform for which the very similar app “Lab Solvents” is available) The authors also cover a few other green chemistry apps, so read the paper for more info! I especially like the Process Mass Intensity feature of the Yield101 app, though this app is $5. For Green Solvents, the app entry page features a list of common solvents displayed as their chemical structures. More desirable solvents are color coded with a green background; less desirable solvents are color coded with a brown background. Selecting a solvent molecule brings up a box that lists the chemical’s name, CAS number, as well as scores on a scale of 1 – 10 for each of the five following categories: safety, health, environment (air), environment (water), and environment (waste). The lower the number, the greener the solvent. In addition, the numbers are color coded with 1-3 displayed as green, 4-7 displayed as yellow and 8-10 displayed as red. Furthermore, the selection box includes easily chosen links to the ChemSpider Web site, the Mobile Reagents app, and the Mobile Molecular DataSheet for more information on the selected solvent. The power of the app is how quickly one can obtain info that should impact solvent choices in lab or in the field (without having to retreat to your desk or a nearby computer). And it’s free! In the future I hope to see these apps provide suggestions for alternative solvent choices (for example, this editorial provides an example of a table Pfizer uses for solvent selection). For instance, I already know dichloromethane is a poor choice of solvent from a green chemistry perspective. How about an alternative choice, Green Solvents app? Trifluorotoluene? By tmckeagberkeleyedu in Environmental Chemistry on April 8, 2013 .